The 36 has all the important characteristics that made the original, the most popular thirty-six foot sailboat in the world. The 36 is built in the same seakindly moderate displacement hull that tracks surely and performs well in a variety of conditions. The deck is the classic trunk cabin configuration designed by sailors, not stylists, so it's proven, comfortable and functional. 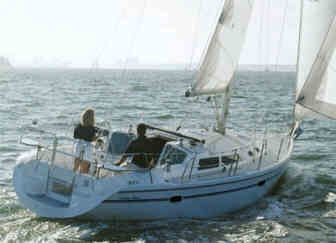 The Catalina 36 has two private double cabins, one forward and one aft. The forward cabin is a V-berth formation. The salon settee converts to form two more berths on the starboard side and a single on port, if necessary. As there is only one head with hot and cold shower, we ideally recommend four people for a comfortable charter.